IC 555 is very versatile and available in 8 pin DIP package and only few components are necessary for constructing a Timer. 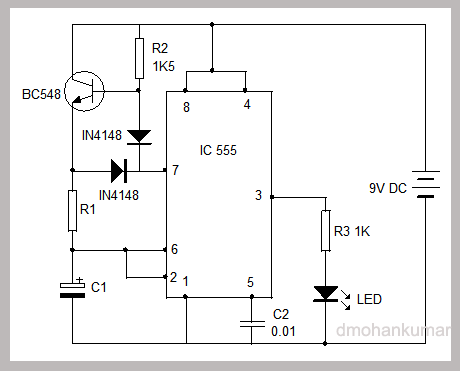 IC 555 works off 5-18 volts and IC 7555 is a low power versions requires voltage as low as 3 volts. Pin1 – Ground pin connected to the Negative rail. 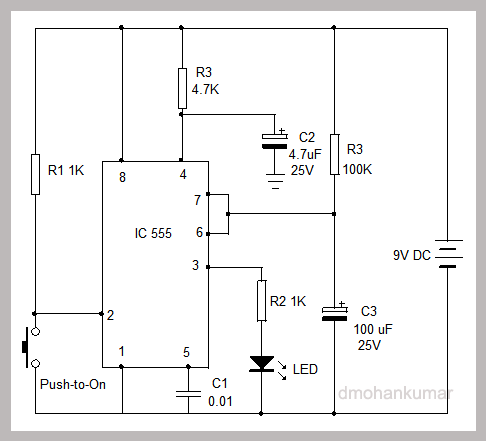 Pin2- Trigger pin that plays an important role to maintain the output status of IC. It is kept at 1/3 voltage of the Vcc ( supply voltage). If voltage at the trigger pin is dropped below 1/3 Vcc , IC triggers. Trigger pin forms the inverting input of the lower comparator. When the IC is used as Timer, the duration of pulse applied at pin2 should be less than the time interval of the RC network used. If the pulse is higher than this, Timer output remains high until, the pin2 is becomes high. Usually the trigger pin is kept high through 1K-10K resistor at 12 volt Vcc. Pin3- Output. It gives 1.7 volts less than the supply voltage. For example, if supply voltage is 12 volts, output will be 10.3 volts. Output can source / sink current and maximum output current is 200 mA so that inductive loads like Relays ( that requires low current) can be directly connected to the output. Pin4– Reset pin. This pin is the input to the base of the PNP transistor inside the IC to set/reset the control Flip-Flop. 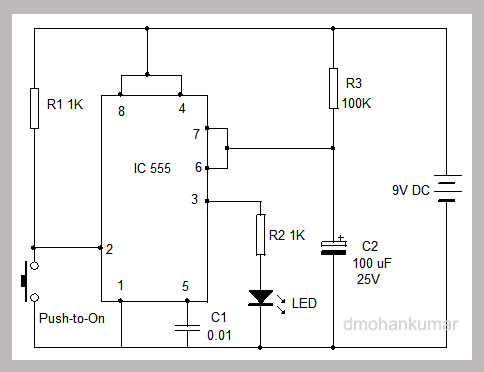 When it is high, IC works normally, and if it is low, IC resets with low output. Usually pin 4 is connected to Vcc to prevent false triggering. It can be used for automatic control of some circuits. If a 4.7K resistor and 4.7uF capacitor is connected to the reset pin, false triggering can be eliminated. See figure. Pin5. It is the Control voltage pin. Pin 5 gives direct access to the 2/3Vcc voltage divider point and connected to the inverting input of upper comparator. In voltage controlled applications, this pin can be used to apply external voltage . Usually it is connected to the ground through a 0.01 (10nF) capacitor. But some designers leave pin5 without connecting. IC still works but is better to use 0.01 capacitor to prevent false triggering, if the circuit is based on sensors. The pin5 can be manipulated to change the IC function as FM transmitter. Changing the voltage level ( through Mic) at pin 5 in the Astable mode, will work as an FM / AM transmitter and the output signals come out through the Areal connected at the output pin 3. 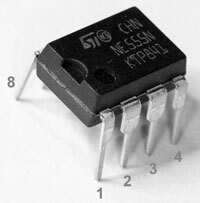 Pin6- It is the Threshold pin usually kept at 2/3Vcc and it is the Non-inverting input of upper comparator. If the voltage at pin6 is above 2/3 Vcc, the internal Flip-Flop resets and changing the output to low. Pin7 – It is the Discharge pin and forms the collector of NPN transistor. Its emitter is connected to ground. It is used to discharge the timing capacitor in timer applications. The timing capacitor is connected between the pin7 and ground so that, when the transistor turns on and discharges the capacitor. 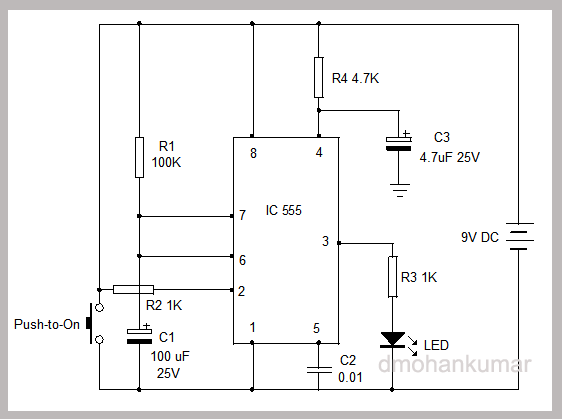 Pin8– This is Vcc or Supply voltage pin. IC555 works between +4.5 volts to 18 volts. But the ideal Vcc is between 5 to 15 volts. The time interval change is very low related to supply voltage and typically 0.1% per volt. 1. One shot Monostable timer – IC555 in the Monostable mode has only one stable output state. That is low. 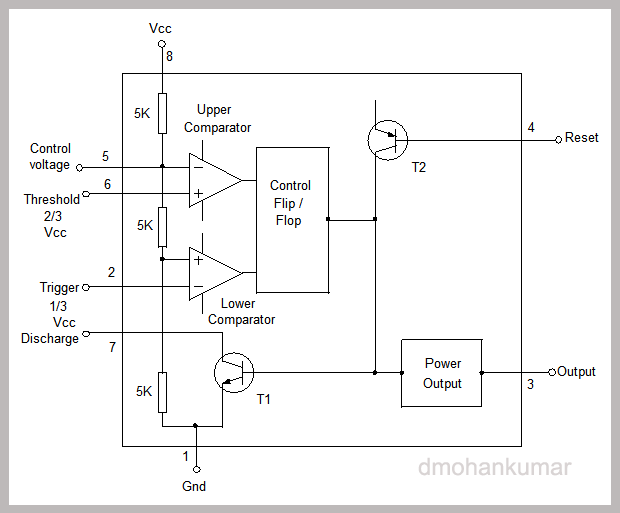 When a negative going pulse is applied to the trigger pin2, output of IC becomes high and remains as such for a time determined by the timing RC (Resistor-Capacitor) network. During standby, the internal Flip-Flop is reset and the output is Zero. The signal at the trigger pin set the flip-flop and the NPN ( T2) transistor conducts. This short circuit across the external timing capacitor preventing the capacitor from charging. 2. Astable operation – Here the IC is not stable and the output turns high and low alternately for the time intervals based on the RC network. 3. Bistable – In this circuit design, IC555 can be used as a latching switch. The output can be changed to high / low by changing the voltage at the Threshold pin 6. In this arrangement, the Trigger pin2 is tied to pin6. 4. Schmitt trigger- In this mode pin6 and 2 are connected together and the output waveform form is available at pin3. A noisy waveform can be appled to the point where pin6 and 2 are connected. Output waveform will be clean square wave. In the Astable mode, the output ( low and high) will not be in equal timings. Addition of a transistor and two diodes at the RC network will make the timing a constant 50% duty cycle.